In a mixture of gases, each gas has a partial pressure which is the hypothetical pressure of that gas if it alone occupied the entire volume of the original mixture at the same temperature. 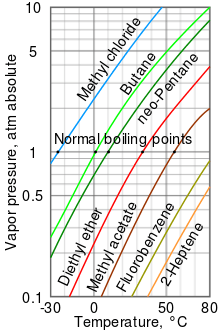 The total pressure of an ideal gas mixture is the sum of the partial pressures of each individual gas in the mixture. ↑ Francis L. Smith & Allan H. Harvey (September 2007). "Avoid Common Pitfalls When Using Henry's Law". CEP (Chemical Engineering Progress). ISSN 0360-7275. 1 2 Normal Reference Range Table from The University of Texas Southwestern Medical Center at Dallas. Used in Interactive Case Study Companion to Pathologic basis of disease.